everything is frozen and cold and grey around these parts, and my face and my life in general have been in desperate need of some color. the one-part solution? a red lip. these are the seven that have been in heavy rotation these past few weeks. for easy-peasy, no-fuss application, you can’t beat the revlon matte and lacquer balms. they’re right up there in terms of quality and color selection with the nars ones, at a fraction of the cost, although the nars ones are incredibly long-lasting and pigmented. 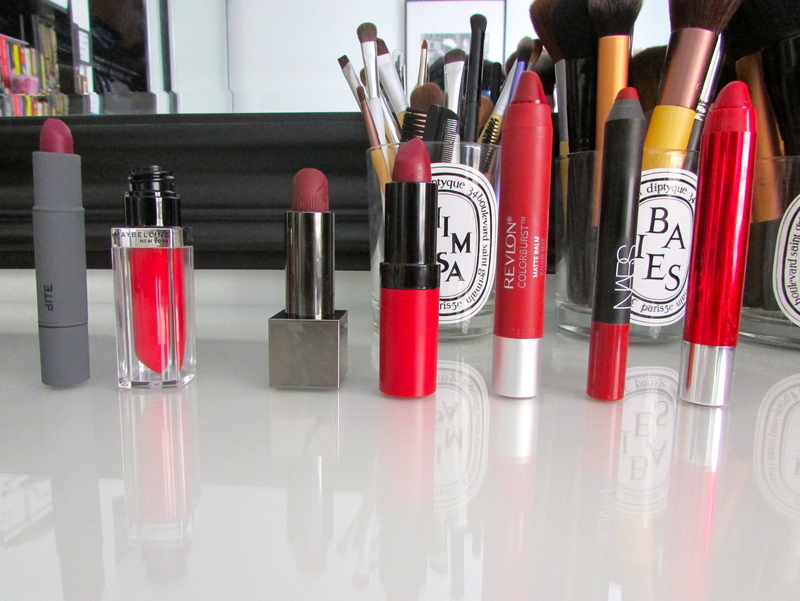 striking is a lovely matte red; provocateur is a shimmering red that leans a little pink on me. 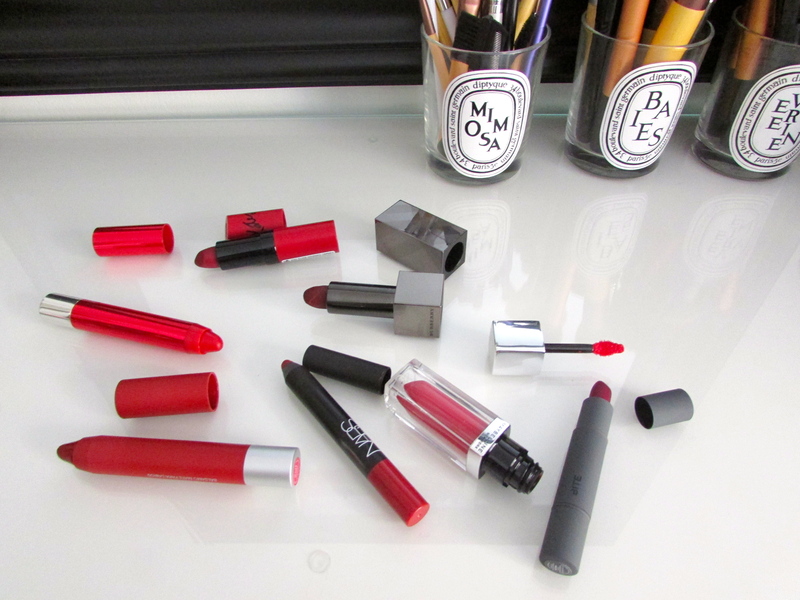 cruella was my first foray into a matte red lip, and it remains one of my favorites. insane pigmentation without having to worry about the color fading or, worse, getting everywhere on your face. the new color elixirs from maybelline have been amazing as well. they feel really nice on the lips and while the staying power is a bit non-existent, the colors are just too nice for me to care too much about frequent reapplication. signature scarlet is exactly as it’s named. you’ve already heard me rave about mulberry here, so I won’t repeat myself…except to say that it.is.beautiful. I finally got my hands on 107 when I went home to my parents for the holidays and made a quick stop at our local Wal-mart. it certainly doesn’t disappoint. the color is rich and deep without being vampy. for ~$5, it’s a worthy pick-up, even if application on this one’s a little trickier. and lastly, my favorite of the favorites. burberry’s lip mist in oxblood. my first foray into burberry cosmetics was a smashing success. I love everything about this. it’s chock full of pigmentation, applies smoothly, has decent staying power, and leaves behind a nice stain that looks lovely on its own and layers well for re-applications. the packaging is lovely as well, with a magnetic cover that has the brand’s stripes etched on. I wore it on Christmas Eve and never looked back. what are your favorite winter lipsticks? I’ve heard so many good things about the wet n wild lipsticks – I keep meaning to grab one and haven’t yet! I’ll keep a lookout for that one next time I’m at the drugstore – thanks! Do it :) Their colour range is great and if you like matte textures, you’ll definitely like them. As long as I apply a lip balm underneath, they work very well for me.